Buy of 12V 10A RELAY. This is a 12 Volt 10 Amp rated SPCO (single pole changeover) miniature relay enclosed in an IP67* sugar cube package. These relays have many uses in renewable energy applications in which a low-power low-voltage solar powered device controls a high-power and/or high-voltage appliance. * IP67 means dustproof and waterproof for at least 1 hour at a depth of 1 metre. The relay coil is rated at 12 Volts and has a coil consumption of 360mW. Therefore at 12 Volts a current of just 30mA is sufficient to trigger the relay. The relay contacts are rated at 10 Amps at 240 VAC (mains electricity) or 12-24 VDC and so can easily be used to switch on 12 VDC and mains-powered pumps, lighting and much more. 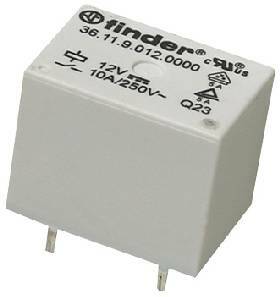 This relay has operate and release times of just 10ms and 5ms respectively, and a coil resistance of 400 Ohms. It is just 21.5 15.5 x 17mm in size.